We are so delighted to be the recipients of the #MakeTodayMatter donation from CTV’s Canada AM and TD Canada! It was an incredible surprise, and one that has continued to bring joy to this most deserving Network. 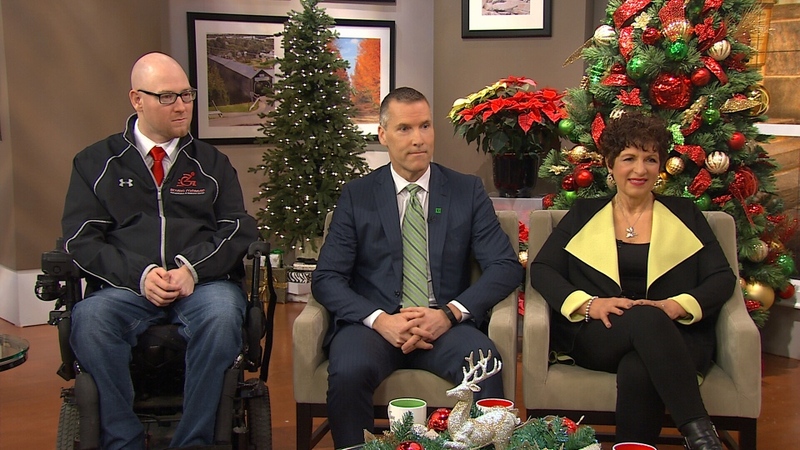 Mike Mulligan, Tim Hockey and Audrey Guth appear on CTV’s Canada AM on Tuesday, Dec. 12, 2014. The founder of a Toronto-area charity was surprised by a donation given to her organization during a live segment of CTV’s Canada AM. Audrey Guth founded Nanny Angel Network (NAN), an organization that provides nanny services to women with cancer in the Greater Toronto Area so they can focus on rest and healing. The organization has helped more than 300 families with free, in-home childcare since it was founded in 2008. In 2013, NAN expanded its services to include bereavement care for children who have lost their mothers to cancer. Guth took part in a panel discussion with TD CEO Tim Hockey and a London, Ont. man who opened a gym for people with disabilities. In addition to founding his gym, Mike Mulligan was given $30,000 to make a difference in someone’s life in November as part of TD Canada Trust’s Make Today Matter campaign, a project that passed out a total of $720,000 in $30,000-donations to 24 customers across Canada and the U.S. The trio was asked to appear on Canada AM to explain why they choose to give back to their communities, and what motivated them to be involved in charities. “Everybody can make a difference. It’s the people who actually give up their own time that do the heavy lifting,” Guth said. Guth, a breast cancer survivor and mother of four, has also founded a nanny placement agency called Diamond Personnel. She was inspired to launch NAN while in the hospital getting treatment. She met other mothers who were struggling to afford childcare while undergoing treatments. “I’m thinking to myself, ‘Oh my God, I’ve lived in a nanny world for so many years and there are all these families that wouldn’t dream of having such a luxury,'” she told Canada AM. She founded NAN to provide part-time relief for mothers who need a break to go to doctors’ appointments and rest. After hearing Guth’s story, Hockey surprised her with an access card to an account with $30,000, telling her she had to spend it in 24 hours. Through tears, Guth said her mind was spinning with possibilities. “Thank you so much,” she said, crying while hugging Hockey. The Nanny Angel Network (NAN) is a registered charity and the only organization of its kind in Canada to provide free, specialized in-home childcare for mothers who have been diagnosed with cancer, for those requiring palliative care and for families requiring additional relief during the bereavement period. Copyright © Nanny Angel Network 2016. All Rights reserved.